Share your American Archives Month activities: Send a note about how you are planning to participate to archivesmonth@archivists.org. Since 2006, the Society of American Archivists has provided members with public relations kits that offer practical information and great ideas to help you make your archives program more visible. You can access past PR kits by visting the AAM homepage. Additional tips and tools are contained in supplementary material ("Get Started!"). Whether you're interested in planning an event, issuing a press release to attract media coverage, or prepping for a media interview, these "evergreen" resources will assist you in enhancing public awareness of your repository—and your profession! The American Heritage Center (AHC) is facilitating a virtual “Rumble in the Stacks!” Staff has selected several characters who are represented by AHC collections and pitted them against one another in bouts. Each bout will have a winner, as decided by voting participants, and winners will advance to the next bracket. At the end of the month, there will be one champion. Details—and instructions on how to place your vote—can be found here. You can follow daily updates for each competitor on AHC's blog or Facebook page. Archives Month Philly is a new annual celebration of archives, special collections, and cultural institutions that draws inspiration from both the national American Archives Month effort and past Archives Week initiatives organized by the Delaware Valley Archivist Group. During the month of October, events will take place throughout California to celebrate the unique and valuable historical collections in its archives, special collections, and historical societies. Events include the Sacromento Archives Crawl, Family History Day, and a Preservation Workshop. Click here for more information about California Archives Month. Each week during American Archives Month will be focused on a specific theme, and events will include presentations, a concert, a family heritage exchange, and a folk dance. The organizations also will be posting fun facts and photos each day in October on social media. Click here for more information. CoSA has put together a Flickr album of 2013 Archives Month posters from across the country. During the month of October, users can participate in the Archives Month Top 10 Contest by voting for the item from Swem's special collections that they find most interesting. Users can vote on select items, including letters, scrapbooks, diaries, rare books, memorabilia, and artifacts. Individuals can vote once online and once onsite. Click here for more information. To celebrate American Archives Month, the public is invited to a slideshow featuring images from the Tallahassee Democrat, many unpublished, showing scenes of Tallahassee life from the mid-1950s to the mid-1960s. The public is also encouraged to participate in Scan Day when archives staff will be scanning original Florida-related family photographs for possible inclusion in the collections of the State Archives of Florida (originals will be returned to donors). Click here for more information. Events throughout the state were held to celebrate American Archives Month, including a Home Movie Day hosted by the Chicago Film Archives and the exhibit Slit Skirts and Voting: Waukegan Women in 1913. The 2013 Archives Month poster commemorates one hundred years of women's suffrage in Illinois. To commemorate American Archives Month, the Meekins Library and Williamsburg Historical Society collaborated on the exhibition At Home in Our Town: Families and Homes in Williamsburg and Haydenville. This collaborative exhibition continues the library’s Living Archives Program and featured photographs by the Howes Brothers (c. 1910) and photographs of the same homes by Eric Weber (2013). Community members could add photographs of their homes, past and present, inside and out, to share stories about their families or people who lived in their homes years ago. 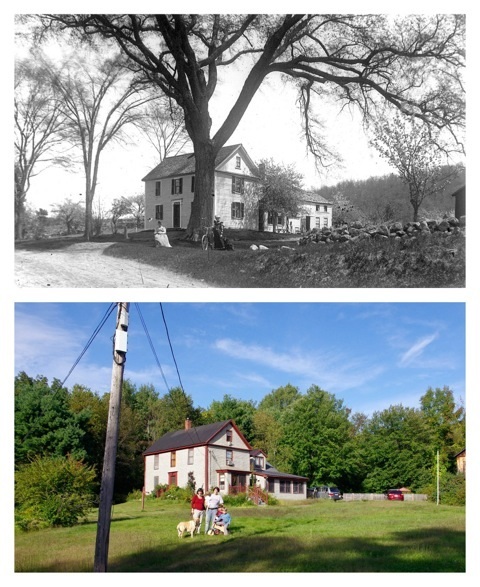 As part of the program, residents were treated to a house tour by craftsman John Otis, who restored the “newest old house in Burgy”—a 1755 home that started life in nearby Northampton, was dismantled and sent to New Hampshire, and was later restored and rebuilt in Williamsburg. The At Home in Our Town exhibit is the fifth in the series of yearly community exhibitions installed for American Archives Month. The National Archives at New York City is hosting the fourth annual Archives Education Institute on October 12. This daylong program brings together thirty-five K-12 educators, archivists, librarians, and museum professionals to discuss strategies for incorporating primary source documents into the classroom. New York Archives Week is an annual celebration aimed at informing the general public of the diverse array of archive materials accessible in the Metropolitan New York City region. The celebration includes open houses, lectures, workshops, and behind-the-scenes tours designed to illustrate the importance of historical records. All New York Archives Week events are free and open to the public. Click here for a calendar of events. To celebrate American Archives Month, the Rock Hall's Archives Reading Room will have extended hours. Four spotlight exhibits will also be featured throughout the month of October. These small exhibits will highlight specific archival collections, including the Les Paul Papers, the Anastasia Pantsios Collection, and the Jane Scott Papers, as well as a history of audiovisual materials. In addition, the archives will feature an Ask-an-Archivist week on Twitter, giving users the chance to ask the Rock Hall's archival experts questions. Click here for more information. The theme of the 2013 Archives Week at the University of Texas at Austin (UT) was "Technology in the Archives." The week included events that demonstrate how emerging technologies affect and are used in archives, as well as the current archival research being done at UT's School of Information. Click here for a full list of events. In honor of Archives Month 2013, the Society of American Archivists–Student Chapter at the University of Wisconsin–Madison will feature stories about unique collections and stories from archives and historical societies around the country throughout the month of October. Seattle City Archivist Scott Cline gives a tour of the archives on Seattle Channel’s City Stream, sharing the photos, documents, and films that illuminate the unique stories of the city. Click here to access the video. “Home Grown! A Celebration of N.C. Food Culture and History” is the theme of the 2013 North Carolina Archives Week, October 21–27. The Society of North Carolina Archivists has created posters, bookmarks, and postcards to celebrate the week and encourages institutions to plan events and post them on the Archives Week Calendar. The University of Alaska Fairbanks Elmer E. Rasmuson Library celebrated American Archives Month with a series of weekly presentations and an open house. The presentations included "Pioneer Voices: Highlights of the Tanana-Yukon Historical Society Audio Collections," “Seek and Perhaps Ye Shall Find . . . Religious Records and Resources for the Study of Alaskan History,” and showings by the Alaska Film Archive. Click here for more information. The Mansfield Library Archives and Special Collections at the University of Montana is celebrating American Archives Month with special events like the Zine-Making Workshop, which will include a brief history of zines and will give each attendee the opportunity to construct a page for a collaborative zine produced by the workshop. Archives and Special Collections is also hosting the second annual Photo Caption Contest. Click here for more information. The University Libraries Center for Southwest Research (CSWR) and Special Collections is celebrating American Archives Month with an exhibition, author reception, and brown bag series. The exhibition “Researching the Southwest: Recent Works using the Collections of the Center for Southwest Research and Special Collections” showcases the works of authors of recently produced Southwestern books, articles, dissertations, video documentaries, and more that utilized CSWR archives in their research. Click here for more information. Utah Archives Month is an annual event sponsored by archives and special collections from across the state. Archives showcased include academic, private, corporate, religious, and governmental repositories. All events are free and open to the public. The theme of this year's archives month celebration is Teaching with Archives. Stephen S. Cure, director of educational services at the Texas Historical Association, will present "National History Day and Tools for Archivists and Librarians," helping educators, archivists, historians, and librarians participate in the National History Day program in Texas. Visit the Wittliff Collections Events page for more information.